Woodstock, a suburb of Cape Town nestles at the base of Devil's Peak. 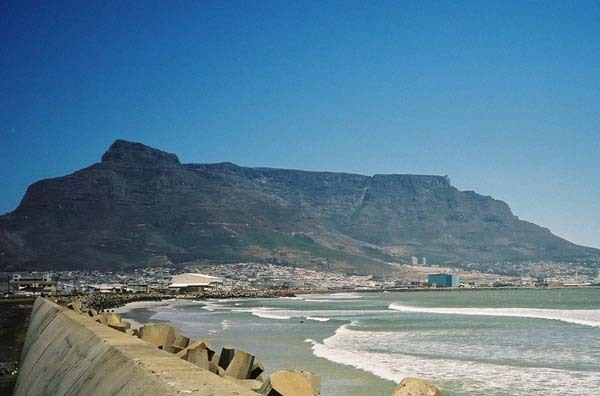 It's situated about three kilometres from the centre of Cape Town and stretches from the mountain to the sea. Woodstock beach is steeped in maritime history and if it could speak could tell many tales. One of the important tales happened way back on the 17th and 18th of May 1865. “At daybreak on the 17th, some of the worst fears and forebodings of ships anchored in Table Bay came true. The north wind which blows in winter turned into a tremendous gale and the ships that were moored in the bay were labouring heavily under its onslaught. During the next eighteen hours no less than seventeen ocean going vessel's mooring ropes broke or their anchors dragged and they were wrecked on Woodstock beach. Not only did the ships run aground but thirty cutters and other boats were also stranded on the beach. Many people lost their lives that night as there were no rescue services to assist people in danger of drowning. Woodstock beach as it is today. Today many of the ships that were wrecked that night still lie under the sand near the seashore. After winter storms a 119 years later we still find parts of the old ships being washed ashore. Moving inland towards the mountains we arrive in the business district and the poor residential areas of Woodstock. Two main roads namely Albert Road and Victoria Road run north to south through the business area. They are lined with many old buildings which are sadly in need of repair. A look at the facades of many of the buildings will give you an idea of when they were built. Some of them are more than a hundred years old. With the decay of the area crime has increased and walking in the streets here is not too wise especially if you are carrying something of value. Not all buildings are tumbledown however and some large corporates have their Head offices in the area. As I mentioned earlier Woodstock is built on the slopes of Devil's Peak and as we move westwards up the slope we find the residential areas of the town. Most of the houses on the higher slopes of the mountain have spectacular views out over Table Bay and towards the north with the Hottentots Holland mountains in the distance. The properties on the upper slopes have become sought after of late because of the views. The other morning while driving to work along the eastern boulevard which runs through the upper reaches of Woodstock I saw a strange sight. The sun was rising over the Hottentots Holland mountains in the distance and they were outlined in black as the sun rose. In the middle of the range was a single cloud that was standing upright and as the sun rose it turned bright orange and looked like a large flame coming out of the mountain. Unfortunately I was not armed with my camera so was not able to get a photograph of it. In the area between the main road and the upper slopes are the smaller houses. They are a mixture of tumbledown and restored with a cosmopolitan type community. More affluent residents have restored some of the old cottages that had become tumbledown to their former glory. Some of these restored houses have been declared national monuments. In one street there is a row of semi detached houses that has been restored. The houses are numbered normally until you get to number 13 which has been given a name instead of a number. Obviously the owners were very superstitious of the number 13. 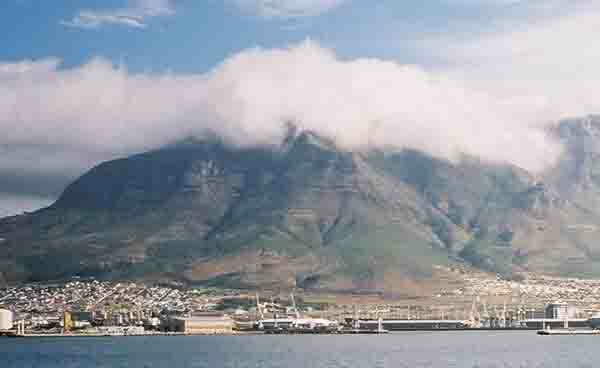 Residents living on Devil's Peak are very aware of the cloud cover which forms part of the Table Mountain table cloth. So much so that a legend of how the cloud came to be there has come about. It's quite interesting so I will repeat it for you. “Van Hunks, a retired pirate who smoked an evil-smelling pipe, challenged a stranger (the "Devil") to a smoking competition on the Devil's Peak mountainside. The competitors puffed and puffed until the mountain was covered in a dense cloud - the origin of the tablecloth - and Van Hunks was never seen again. He is still puffing away with the "Devil".) as you will notice when you visit Cape Town. Unfortunately today on this peak another drama is also playing itself out as sharpshooters hunt down the tahrs that have inhabited the mountains for more than a hundred years. The sounds of gunshots on the slopes must be something new for residents as the last time anybody hunted on Table Mountain and the slopes of Devil's Peak must have been in the 1800's. The same cannot be said for the lower areas of town as due to the levels of crime gunshots are often heard. With South Africa having gained the right to host the Soccer World Cup in 2010 and with the election of a new premier in the Cape Parliament we can only hope that crime will be dealt a real blow and that areas such as the lower part of Woodstock will once again be restored to their former glory.